The staff of Martin & Winkler provides the best in general dentistry, including cosmetic and restorative procedures. Whether you’re interested in a dental cleaning or a complete smile makeover, a Martin & Winkler dentist can help you. We utilize laser dentistry in our Auburn and Syracuse dental practices to provide faster healing, reduced risk of infection, and less post-operative pain. Our dental offices in Syracuse and Auburn can meet all of your dentistry needs. General, cosmetic and restorative dentistry involves procedures that aim to enhance the look, function and health of your existing smile. Our dental patients have reported being very pleased with their results, and many have suggested the services of Martin & Winkler to their friends and families. While brushing twice a day and flossing regularly are good ideas, over time your teeth may still build up unwanted materials. To keep your teeth and gums their healthiest, you should get your teeth professionally cleaned twice a year by a qualified dental professional. If a tooth root has become infected, root canal therapy is necessary. A root canal involves the removal of infected nerve within the root, a thorough cleaning of the area, and a subsequent filling of the root to replace the pulp. A permanent filling or crown is eventually placed over the treated tooth. If you are in need of a root canal, consider a general, cosmetic and restorative dentist at Martin & Winkler in Central New York today. Fillings, also known as direct restorations, are placed into a prepared cavity to restore the health of an adversely affected tooth. White composite material fillings leave treated teeth virtually indistinguishable from existing teeth. 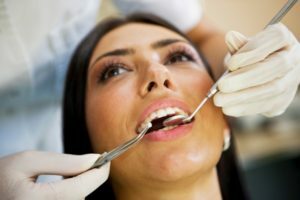 Fillings can be applied in just one visit. To find out if cosmetic fillings are right for you, contact the cosmetic and restorative dentists of Martin & Winkler today. For more information about cosmetic and restorative procedures, contact the dentists of Martin & Winkler, serving patients in Syracuse and Auburn, New York.